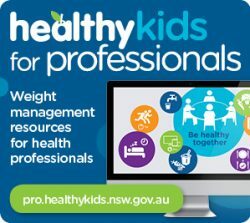 Downloadable resources for Health Professionals. There are eight simple steps to help your patients lead a healthy lifestyle and get back on track. Translated versions can be downloaded in Arabic, Burmese, Chinese Simplified, Chinese Traditional, Farsi, French, Hindi, Karen, Swahili and Vietnamese. 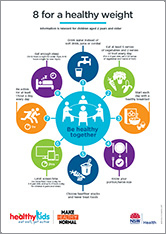 There is plenty you can do to help your child and family eat well, be more active and stay healthy. Translated versions can be downloaded in Arabic, Burmese, Chinese Simplified, Chinese Traditional, Farsi, French, Hindi, Karen, Swahili and Vietnamese. 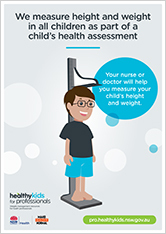 It’s not always easy to tell if a child is a healthy weight for their age and height. 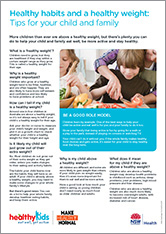 Children and teenagers need to grow, but they are healthiest if they stay within a certain weight range as they grow. This is called a healthy weight for their age. Translated versions can be downloaded in Arabic, Burmese, Chinese Simplified, Chinese Traditional, Farsi, French, Hindi, Karen, Swahili and Vietnamese. Translated versions can be downloaded in Arabic, Burmese, Chinese Simplified, Chinese Traditional, Farsi, French, Hindi, Karen, Swahili and Vietnamese. 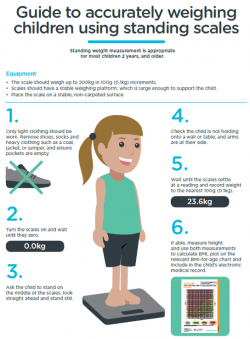 Standing height measurement is appropriate for most children 2 years, and older. 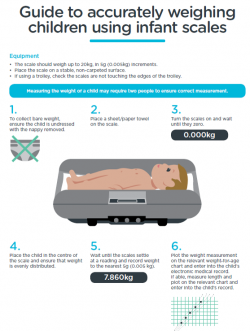 Length measurement is appropriate for most children under 2 years, and older if unable to stand. 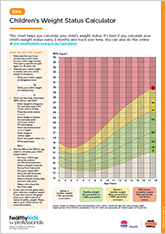 Parents can use this chart to determine their child’s weight status using a standard calculator. 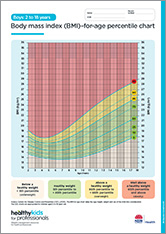 It’s best if you calculate your child’s weight status every 3 months and track over time. 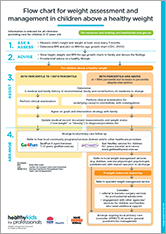 You can download the high resolution, print ready PDFs here. 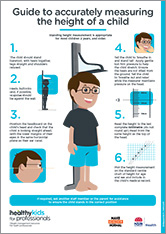 A poster promoting height and weight measurements. The download is ready for print. Appropriate for most children 2 years, and older. Appropriate for most children 2 years, and under. 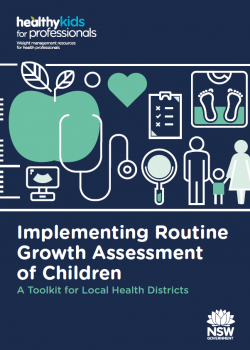 Find out more information about the steps to implementing routine growth assessment of children by downloading the toolkit. 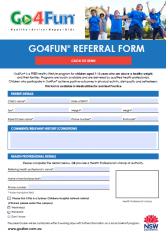 Learn more about Go4Fun® with these consumer-facing flyers. 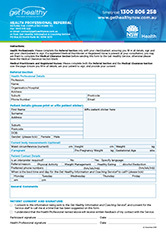 Fill out the form and send back to Go4Fun. 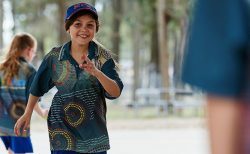 The parent/carer of the child referred will be contacted within five working days with further information on a local Go4Fun® program. 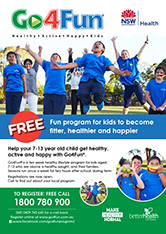 Free fun program for kids to become fitter, healthier and happier. Videos promoting Go4Fun® ready for download. Children from the area who are above a healthy weight and have completed/ are enrolled in Go4Fun. Clinics are multidisciplinary and include paediatrician, dietitian, exercise physiologist and psychologist. Clinics are held monthly. Currently there is one tertiary multidisciplinary clinic for children and families who are well above a healthy weight. 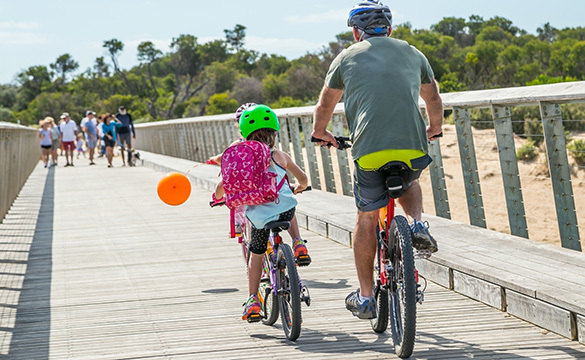 The clinic is based at the Children’s Hospital Westmead. The clinic is available for children aged 0-16 years with a BMI Z score > 2.5 who have/are enrolled in Go4Fun. Clinics are multidisciplinary and include paediatrician, dietitian, exercise physiologist and psychologist. Clinics are held monthly. 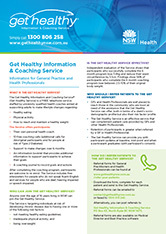 The Get Healthy Information and Coaching Service® (Get Healthy Service) is a FREE telephone service staffed by university qualified health coaches aimed at supporting adults to make lifestyle changes. Eligible for people 16 years and above. GPs and other Health Professionals can target those in the community who need the Get Healthy Service the most, both in terms of a client’s socio-demographic profile as well as their risk factor profile. 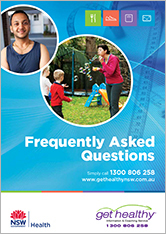 FAQs to help you answer all your questions about the Get Healthy Program. 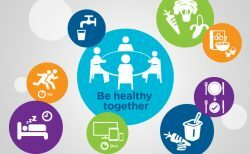 Videos promoting the Get Healthy Service ready for download. Suite of promotional images, ideal for your websites, emails, and newsletters. Suite of icon files from the ‘8 for a healthy weight’ resource.